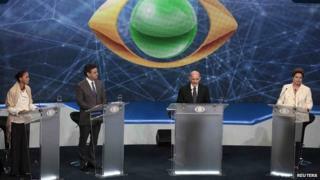 Candidates in Brazil's presidential election have taken part in the first televised debate of the campaign. Incumbent President Dilma Rousseff went head to head with main rivals Marina Silva of the Brazilian Socialist Party (PSB) and Aecio Neves of the PSDB. The BBC's Gary Duffy in Sao Paulo said there were some individually strong moments but no knock-out blows. Ms Rousseff is ahead in the polls for the 5 October election but analysts predict it will go to a second round. Ms Silva has replaced the former PSB candidate Eduardo Campos, who died in a plane crash earlier this month. In the much-anticipated debate, President Rousseff defended her government's popular social programmes but blamed the international economic crisis for the the country's slowing economy. The latest opinion polls in Brazilian media on Tuesday showed Ms Silva had narrowed President Rousseff's lead to 34%, down from 38% in early August. It gave Ms Silva 29% of voter support and Mr Neves 19%. The poll, published by O Estado de Sao Paulo newspaper, has a margin of error of plus or minus two percentage points. Tuesday's televised debate also includes candidates Eduardo Jorge (PV), Levy Fidelix (PRTB), Luciana Genro (PSOL) and Pastor Everaldo (PSC). President Rousseff is seeking re-election with the Workers' Party (PT). Ms Silva used to be a member of the PT during the government of Luiz Inacio Lula da Silva, but has since become a stern critic. A former environment minister, she ran for president in 2010 for the tiny Green Party and secured 19 million votes, but was knocked out in the first round. She decided to run for vice-president alongside Mr Campos after the Electoral Court in October 2013 refused to register her political movement, Rede Sustentabilidade (The Sustainability Network). However, she was appointed as the PSB's main candidate after his sudden death. Mr Campos's private jet crashed in bad weather in the port city of Santos, Sao Paulo state, while travelling from Rio de Janeiro to the seaside resort of Guaruja. An investigation into the crash, which also killed six others, is under way. The election will go to a second round later in October if no candidate gets more than 50% of the votes.